" To do it, we have the Public Facility Maintenance Agency (PPSU) personnel under Pengadegan Urban Village, Pancoran, South Jakarta"
To anticipate extreme weather and minimize dengue fever case, a water channel on Jalan Pengadegan Barat, RW 05, Monday (1/28), cleaned up from mud that has reached 20 centimeters. 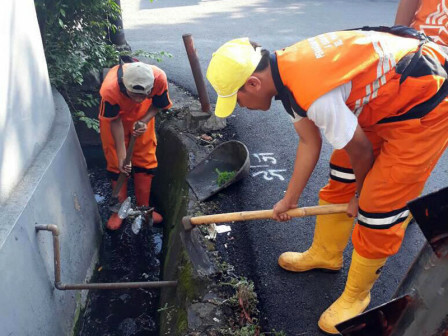 “To do it, we have the Public Facility Maintenance Agency (PPSU) personnel under Pengadegan Urban Village, Pancoran, South Jakarta," expressed Pengadegan Urban Village Head, Muhammad Mursid. He added that it is also carried out to add capacity volume of water that comes in. “The channel itself has 700 meters length with 40 centimeters width,” he said.